My father was a playwright and a poet. Unfortunately, he remained unpublished (although not unproduced) when he died in 2009. He had genuine talent, but was stylistically difficult to market. I wanted to see him in print, both as a way of ensuring that a goal of his was met, and as a hold-in-your-hand tribute for my family and myself to own, so I published his major works myself. I’ve done a lot of research into the rapidly growing self-publishing industry over the past couple of years, largely due to my involvement in reading and reviewing works by indie authors. I absolutely believe that there is still a place for mainstream publishing. After all, when we writers dream about being published, we probably have a particular publisher or three that is centre stage in those dreams. (No, I’m not going to name my One True Publisher. Although my friends can likely guess.) The more I read and learn about indie publishing, however, the more I am convinced that it’s an excellent development for niche fiction and non-fiction. The big publishers have a bottom line to worry about, so they have to focus on the fads and books likely to generate big sales in a short time-frame. Sometimes, however, you don’t want to read (or write!) about vampires or dystopian futures. You might want to delve into queer fiction or pagan memoir… or historical, poetic plays, like my father’s. And that’s where indie publishing really comes into its own. After months of editing, formatting and design, I originally decided to use Blurb to publish Dad’s book. I’d used them for a book of photography in the past and had been pleased with the quality of the finished product. However, I quickly discovered that the Blurb system has not yet come into its own with regard to books consisting of a lot of text and, after spending days wrestling with their software only to find that the time I’d spent was wasted due to the file’s refusal to upload, I decided to seek out a better provider. Ultimately, I was satisfied with the experience. I’m not sure if or when I’ll be self-publishing again but I enjoyed the process and the final outcome this time around. 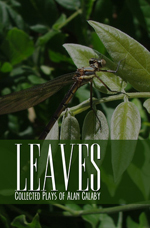 And, for anyone who’s interested in seeing the final project, you can check out Leaves: Collected Plays of Alan Calaby on Goodreads and Amazon (although the “click to look inside” is using a previous version, for some reason).